This study provides empirical evidence on how hotel cancellation policies are changing in recent years. The findings demonstrate that while hotels are experimenting with stricter cancellation windows, their cancellation penalties do not appear to become stricter. 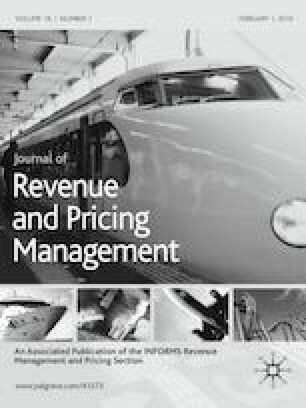 We discuss this counterintuitive discrepancy, explaining the rational with theoretical models of price discrimination and empirical observations of consumer behaviour, both within the framework of hotel revenue management practices. Bureau of Transportation Statistics. 2017. Reservation Cancellation/Change Fees by Airline 2017. https://www.bts.gov/content/reservation-cancellationchange-fees-airline-2017. Accessed 12 May 2018. Dylan, S. 2017. Hyatt Introduces Stricter Cancellation Policy for 2018. https://news.get.com/hyatt-introduces-stricter-cancellation-policy-2018/. Accessed 12 May 2018. Genter, J. T. 2017. Marriott Changes Policy, Drops Free Same-Day Cancellations. https://thepointsguy.com/2017/06/marriott-drops-free-same-day-cancellations/. Accessed 12 May 2018. Hanson, B. 2017. U.S. Lodging Industry Fees and Surcharges Forecast to Increase to a New Record Level in 2017—$2.7 Billion. http://www.scps.nyu.edu/about/newsroom/news/2017/u_s_lodging_industry.html. Accessed 12 May 2018. McNutt, E. 2017a. Hilton Follows Marriott’s Lead, Changes Cancellation Policy to 48 Hours. https://thepointsguy.com/2017/07/hilton-changes-cancellation-policy/. Accessed 12 May 2018. McNutt, E. 2017b. IHG the Latest Chain to Restrict Its Cancellation Policy. https://thepointsguy.com/2017/08/ihg-changing-cancellation-policy/. Accessed 12 May 2018. Mest, E. 2018. Hyatt the latest to adopt stricter cancellation policy. https://www.hotelmanagement.net/guest-relations/hyatt-latest-to-adopt-stricter-cancellation-policy/. Accessed 12 May 2018. Miller, D. 2017. Cancellation changes give owners inventory control. http://hotelnewsnow.com/Articles/212050/Cancellation-changes-give-owners-inventory-control/. Accessed 23 Aug 2017. Montevago, J. 2017. As Hilton Follows Marriott, 48-hour cancellation policies become an industry issue. http://www.travelmarketreport.com/articles/As-Hilton-Follows-Marriott-48-Hour-Cancellation-Policies-Become-An-Industry-Issue/. Accessed 12 May 2018. Peltier, D. 2016. Hilton CEO says cancellation fees will stick around even if guests hate them, Retrieved online from https://skift.com/2016/02/26/169044/. Accessed 12 May 2018. Schlappig, B. 2014a. Hilton Changing Global Cancellation Policy. https://onemileatatime.boardingarea.com/2014/11/10/hilton-changing-global-cancellation-policy/. Accessed 12 May 2018. Schlappig, B. 2014b. Marriott changing global cancellation policy. https://onemileatatime.boardingarea.com/2014/10/12/marriott-changing-global-cancellation-policy/. Accessed 12 May 2018. Schlappig, B. 2017. IHG rolls out stricter cancelation policy in the Americas. https://onemileatatime.boardingarea.com/2017/08/04/ihg-cancelation-policy-changes/. Accessed 12 May 2018. Smith, S. J. 2012. The relationship between perceived personal fairness, social fairness, hotel cancellation policies and consumer patronage (Doctoral dissertation). http://etd.fcla.edu/CF/CFE0004269/FINAL_COPY_Scott_Smith_All_chapters_Apr_12_2012.pdf. Accessed 27 July 2016. Velten, M. 2017. Cancellation policies in combination with scarcity-and social proof appeals: a study into the effects of cancellation policies and persuasion cues on consumer responses within the online booking industry (Master’s thesis). http://essay.utwente.nl/72502/1/Velten_MA_BMS.pdf. Accessed 20 May 2018. White, M. 2015. Hilton wants you to pay $50 for what? http://time.com/money/4164197/hilton-new-cancellation-fee/. Accessed 12 May 2018. White, M. 2017. New hotel policies mean a late cancellation will cost you. https://www.nytimes.com/2017/07/17/business/new-hotel-policies-mean-a-late-cancellation-will-cost-you.html. Accessed 12 May 2018. Wiener-Bronner, D. 2017. Marriott cancels its 24-hour cancellation policy. http://money.cnn.com/2017/06/16/news/companies/marriott-cancellation-policy-change/index.html. Accessed 12 May 2018.